Ceremony at Tata Memorial Centre, Mumbai. The Governor of Maharashtra, Ch. Vidyasagar Rao and other dignitaries were present on the occasion.The Vice President said that researchers must explore ancient Indian medical systems like Ayurveda for alternative solutions. 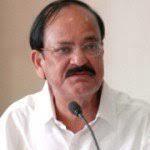 We should see if there are some indigenous cost-effective solutions that may be useful to make cancer treatment more affordable, he added.The Vice President said that Cancer is a major public health concern in India and has become one of the 10 leading causes of deaths. He further said that Cancer is one of the dreaded diseases and also a very costly disease in terms of treatment. A better understanding of the likely causes and early detection could help reduce the disease burden in our country, he added.